Well, I would like to have fixed bug "networkmanagement's kded module crashes when opening kwallet" before this release but I have not been able to reproduce it, so I have not figure out how to fix it. I am doing this release basically to push the changes to make Plasma NM resilient to problems when contacting kded, which is the cause of "desktop freezes" bug. 294777: Fix "Last Used label resets to Never after a minute".
. Use preferences-system-network as KCM icon.
. Enable/Disable OK button when prompting user for secretes, and fix WEP key validator. 293711: Add about data for kcm modules. 293691: Use localized provider's name and plan in Mobile Connection Wizard. 293045: Mark GSM password as NotRequired if it is empty.
. Add warning messages to debug possible dangling pointer. 209464: Fix wifi hidden network support. 293068: Allow creating cdma connections when no cdma device is plugged.
. Don’t show GSM Access technology in tray icon while connecting as it obscures the connecting progress bar. 290964: Fix and workaround graphical artifacts caused by upgrading to KDE SC 4.8.0. 287002, 282022, 286424: Use asynchronous DBus API in plasmoid and kded module communication. kde-soc-mentor@kde.org, now is wait and see if the proposal will be accepted or not. Meanwhile I already passed some material for Arthur to study and pushed a commit to add a #ifdef to show a QML view instead of the current popup. 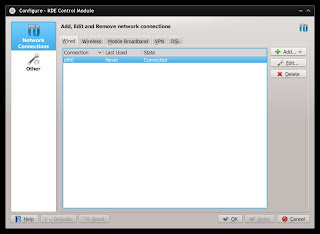 In the Ethernet tab restrict the connection to a specific ethernet device. If you have more than one ethernet device do not be afraid, the "eth0" below is just an user-friendly way to select the device, what Plasma NM really uses is the device's MAC address. If for example you have eth0 and eth1 in your system, then you restrict to eth0 but for some reason the system swaps eth0 for eth1, Plasma NM is smart enough to see that and it will automatically change the configuration to eth1. Notice the "Nome do sistema" field (System name) showing "ppp0", that means the connection is really active. For some reason nm-applet does not require changing the wired connection configuration, which sounds reasonable. But without a connection to test it will take me time to figure out how to make that work. Until then DSL users can use the configuration above.